Here are a few more numbers. The mountain covers an area of 1900 square miles (5100 km3) of land and has a volume of 18,000 cubic miles (75,000 km3). 18,000 cubic miles??? That’s 18x the volume of air estimated by the National Park Service that’s between the rims in the Grand Canyon! 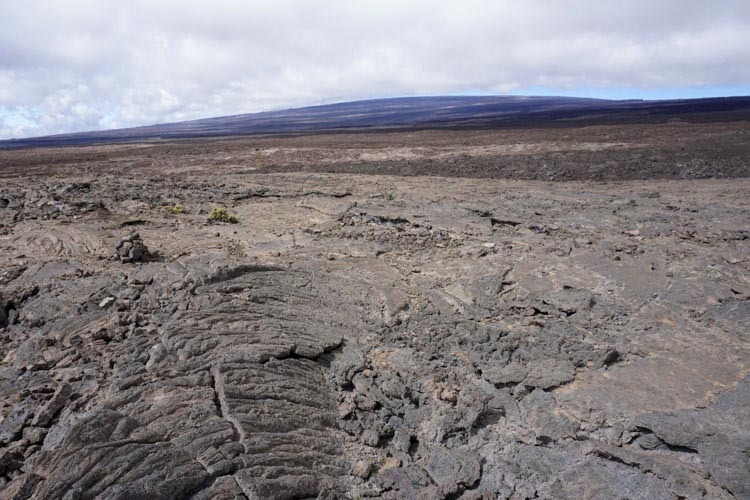 Considering that Mauna Loa’s oldest lavas (deep beneath the seafloor) are no older than 1 million years old and probably much younger –that’s a lot of lava in a geologically short period of time. 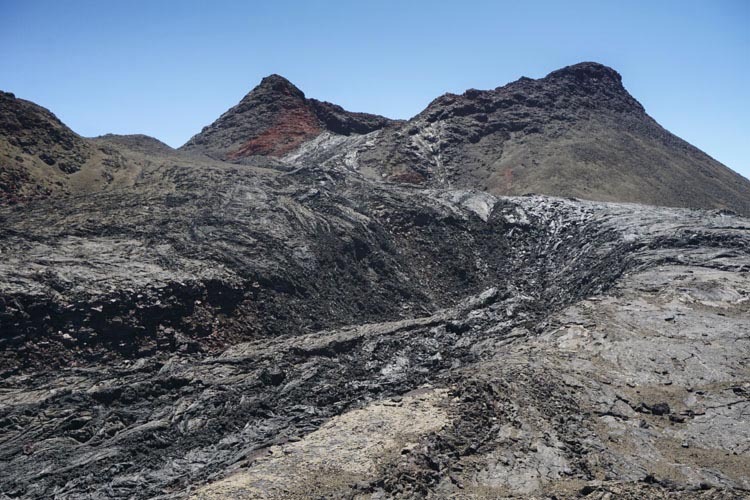 And we’re experiencing its growth today –the volcano last erupted in 1984 –and 32 times before that since 1843. 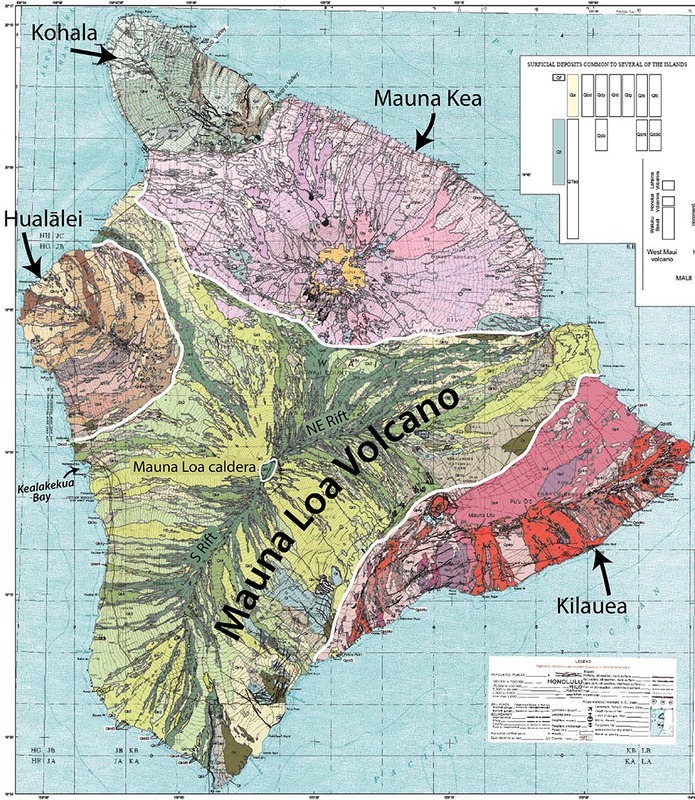 To gain more appreciation for this huge mountain, look at this geologic map of Hawaii, made by the USGS in 2007. 2007 USGS Geologic Map of Hawai’i. Lavas from Mauna Loa, cover half the island. Mauna Loa volcano, outlined in white, covers half the Big Island of Hawai’i. From the map, you can also see that many of its lavas erupted from the summit area, now a caldera –and that most of the other lavas came from fissures along the volcano’s southwestern and northeastern flanks. If you click on the map, you can see it in a larger view. Note that the red-colored area, lavas from Kilauea, make up the southeastern coast. That’s where most of the eruptive activity is now, but Mauna Loa’s not at all finished. 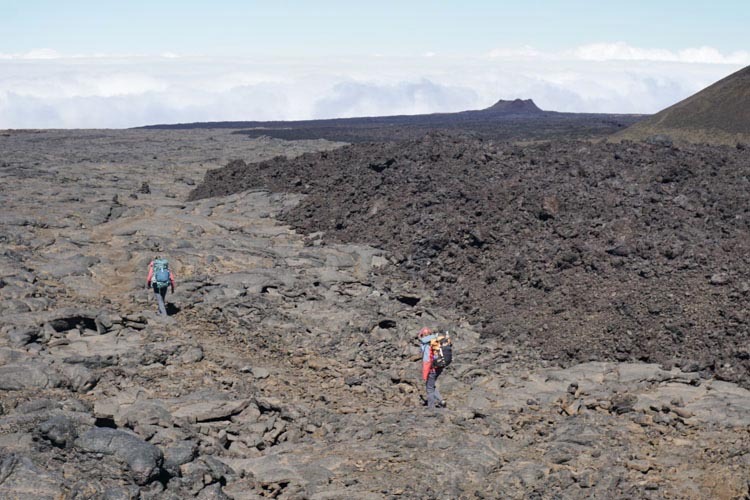 This September, I spent 4 days backpacking up Mauna Loa’s northeastern flank to its summit –and I got to do it with my daughter Lindsay and her friend Morgan. 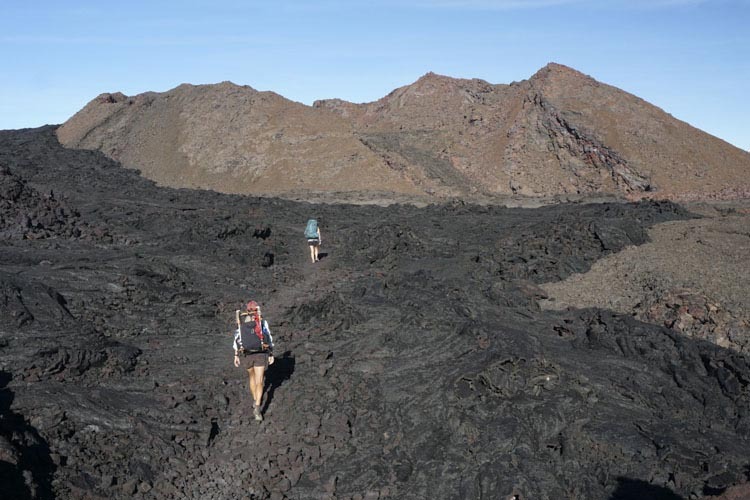 What an incredible trip –41 miles of young lava in 4 days. 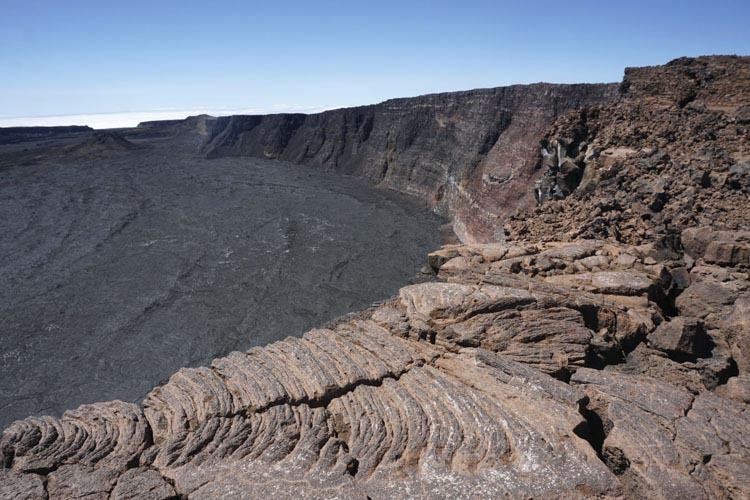 What follows are photos and descriptions of some of Mauna Loa’s amazing features. For starters, it was beautiful. We walked over a dizzying array of shapes and colors created by both pahoehoe and aa flows, some of which were younger than me. In general, the older flows, being more oxidized, took on a rustier-brown appearance. Below is a view of the NE Rift of the volcano, the source of much of Mauna Loa’s recent lavas. The view’s from Red Hill, an 8600 year-old cinder cone. There’s a hut at Red Hill where we spent our first and third nights. Our second day, we walked up the NE flank, across and along lava flows all erupted within the last 200 years. And cinder cones –and spatter cones–and, and, and! And here’s my favorite cinder cone, at an elevation of about 12,500. It’s called Pohaku ‘ohanalei –and you can see a pahoehoe flow coming right out of it! And it’s really glassy–look at how reflective it is. In fact, most of the flows were glassy. Once you reach the elevation of 13,000′, you cross a couple big cracks that are part of the rift zone and then you walk across a frozen lava lake. The lava lake fills the so-called “North pit” of the summit caldera and is partly filled with lava from 1984. 1984… I’m older than that. We spent our 2nd night in a hut on the southeastern rim of the caldera –directly across the caldera from the summit. Our plan was to get a good start in the morning and go back to the trail junction at about 13,000 feet where we’d drop our packs and hike the 5 mile trip to the summit and back, get our packs, and then hike down to Red Hill. But first… the night sky from 13,250 in the middle of the Pacific, with the rounded summit of Mauna Loa in silhouette was something I’ll never forget. Cosmos and Cosmic–I fell in love. Here’s the sunrise view. 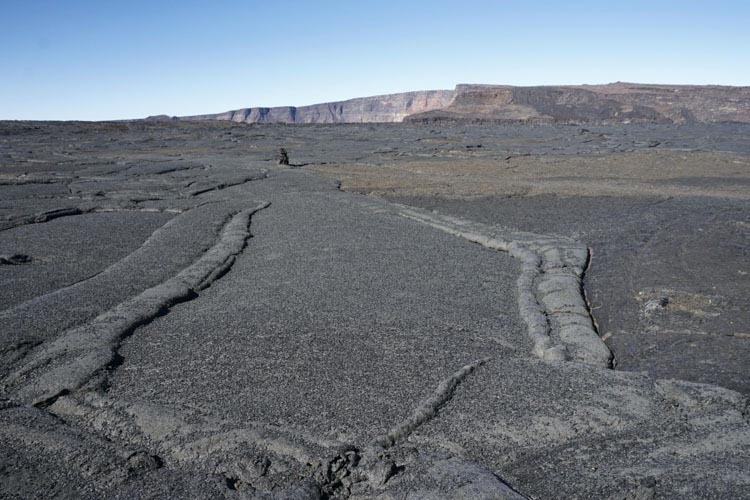 The cracks form along the edge of the caldera–the floor of which is some 150-200′ straight down. That morning, we hiked to the trail junction and dropped our packs and walked up to the summit. It was nice to not carry anything except a camera! 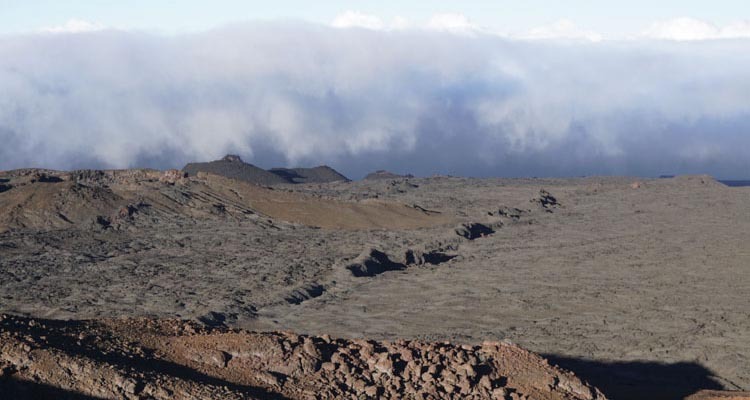 Here’s a photo from near the top –it shows a pahoehoe flow coming from …space! 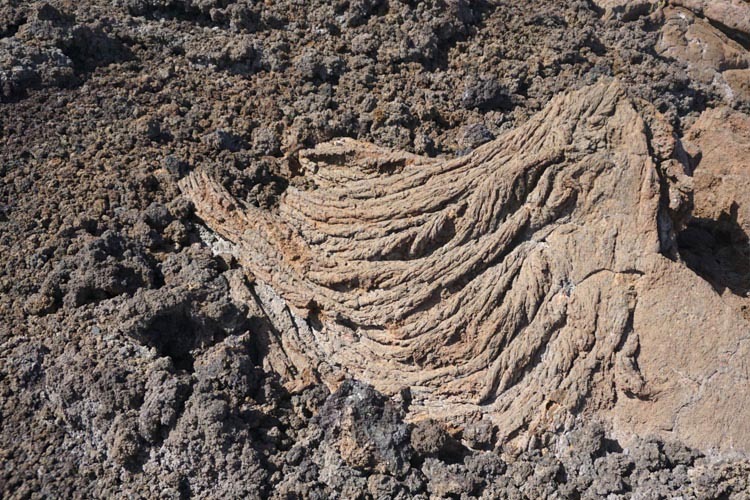 That’s because the lava predates caldera formation –the other side of that lava flow is buried under all the new lava that now fills the caldera. And here we are! I forgot to brush my hair. By the time we got back, I had some nice dreads going. Summit selfie! Marli (left), Lindsay (center), Morgan (right). We got back to the trail junction at about 12:30pm –where we saw the only other people of the whole trip –they were taking a day hike from the Mauna Loa Observatory, which you can reach by car from the Saddle Road. That’s also where I noticed these orange peels. Orange peels! Really? Orange peels dry out and get hard and DO NOT BIODEGRADE –unless you give them something like 1000 years. There’s also a punch of toilet paper scattered about up there. Come on people! Pack out your crap! Back at our packs, Lindsay pointed out (again) how little time we had to get back to the hut at Red Hill, 9 miles away–unless we wanted to get stuck on the lava flows when it was dark. So we bombed down the mountain at what felt like 90 mph (it was more like 2mph, actually) –and we reached Red Hill with an hour to spare. And the views? Awesome! I especially loved seeing Mauna Kea, which we could see from Mauna Loa’s summit all the way down to Red Hill. 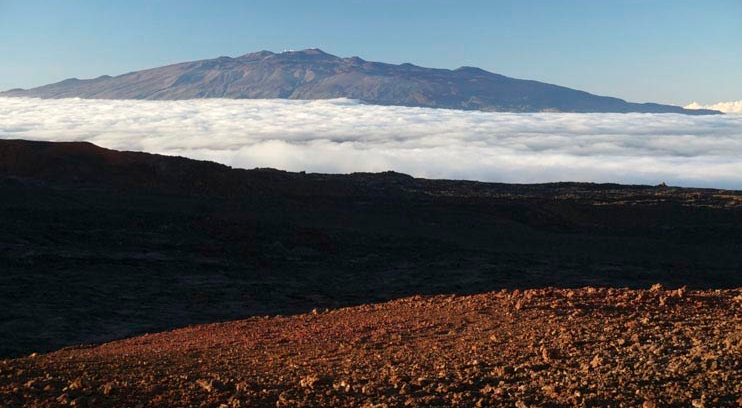 Mauna Kea is the big shield volcano next to Mauna Loa, and actually a little higher. If you compare their overall sizes on the geologic map though, you’ll see that Mauna Loa is still a lot bigger. And here’s Morgan watching the sunset from Red Hill. …back to the immensity of this volcano. The day before we started our hike, we drove around to the other side of the island to the town of Captain Cook where we snorkled at Kealakekua Bay. 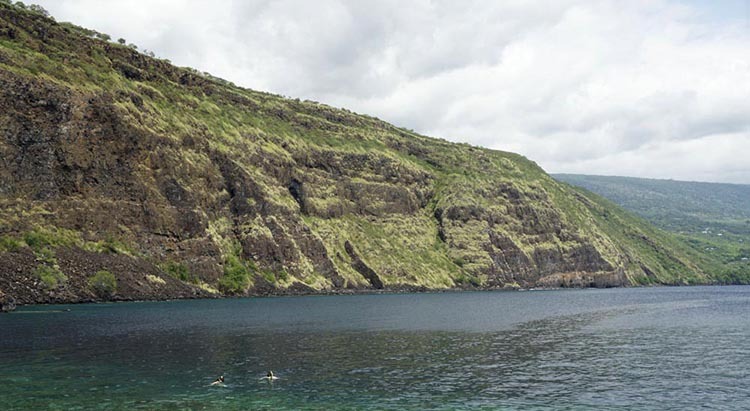 It turns out that the lava flows in the sea cliffs are also part of Mauna Loa –you can see that on the geologic map (Kealakekua Bay is marked). That’s actually the profile of the volcano in the background. 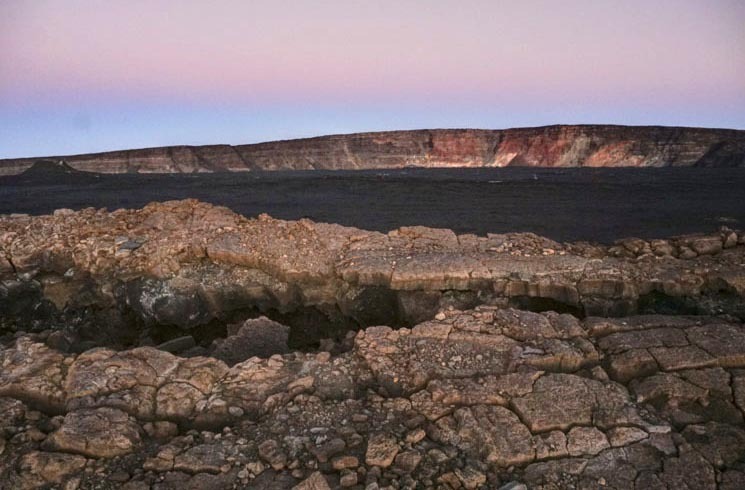 And those sea cliffs are there because it’s the head scarp of a giant undersea landslide! Most of these photos are freely downloadable at slightly higher resolutions from my website: Geologypics.com. You can type the id number (visible in the photo’s caption) into the keyword search –or you can just type “Mauna Loa” into the search to see these and a whole lot of other images! Fantastic pics and fascinating commentary. Bravo Marli!